Patrons will have more than 20 pairings to choose from with delicious food plates made from locally sourced ingredients by the South Shore’s top eateries, all to be washed down with the regions’ finest local wines, beers and spirits. Sample the Sierra pairings are listed here. Last year, The Lake House and Bella Grace Vineyards teamed together to win the award. 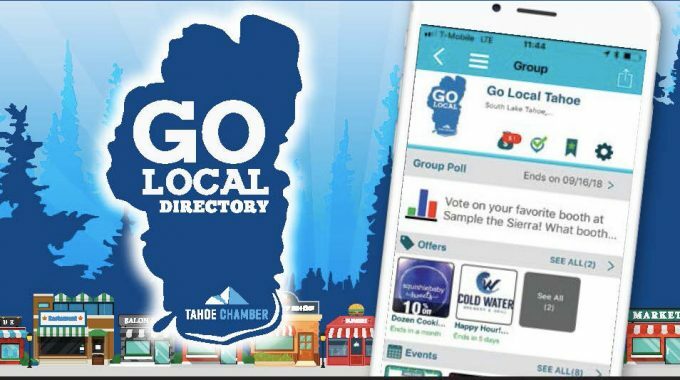 The 2018 Best Tasting Experience winner will be announced at 4:30 p.m.
Attendees are encouraged to download the free app and join the Go Local Tahoe group in advance in order to vote on their favorite booth. The Go Local Tahoe group promotes and rewards the value of shopping and dining locally. Sample the Sierra, Lake Tahoe’s largest farm-to-fork festival, will be held Saturday, Sept. 15 at Bijou Community Park. Early bird tickets are still on sale. Get yours now as we may sell out of day-of tickets at the gate. next post: Tickets are going fast—get yours today!